I've zero experience with this guy, but I really like him. In a mono-MU deck, he's like a mini-Dutch Courage with legs. Combined with a rush strategy, this guy could easily allow you to push through stories for the win. 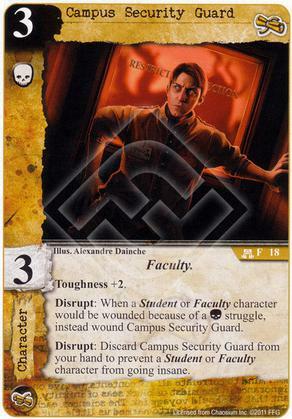 Combine him with Board of Trustees for a little extra Toughness or Infirmary for repeated use. I especially like the latter option because of the synergy with the Guard's discard ability. You shouldn't underestimate the value of a free ability, especially when it's a surprise and when it could save a character from losing an attachment because of insanity. Every campus needs a little protection, so your nerds can focus on their studies and not worry about getting beat up.